On Thursday, the pregnant Duchess of Sussex stepped out in London hand in hand with husband Prince Harry for their second time attending the Endeavor Fund Awards together. The fund, which was co-founded by the Duke of Sussex back in 2012 along with his brother, Prince William, and sister-in-law, Kate Middleton, aims to support wounded, injured and sick service personnel and veterans through sport as part of their recovery and rehabilitation. The awards are held to honor those who have excelled in sport despite an injury or illness. Whether on purpose or accidental, Markle seemed to channel her Alexander McQueen black suit from last year's awards when she opted for what could have passed as the dress version: a Givenchy design featuring a white collared top with sleeves rolled and floor-length black wrap skirt. 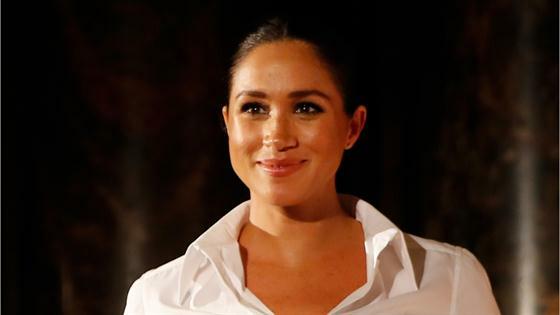 As royal enthusiasts may remember, the brand is a dear one for the American star, who donned a gown designed by Givenchy's creative director, Clare Waight Keller, on her wedding day. For some extra glitz, she slid on Aquazzura pumps adorned with gold straps and finished the look with a sleek bun. Prince Harry dressed in his usual style of formalwear—this time, a slate suit and tie. At the time of the awards last February, the two were still months away from their May nuptials seen around the world. This time around, they're expecting their first child together, a baby due in the spring. But, first, they have some honorees to celebrate.